The term “vitamin E” refers to a family of eight related, lipid-soluble, antioxidant compounds widely present in plants. The tocopherol and tocotrienol subfamilies are each composed of alpha, beta, gamma, and delta fractions having unique biological effects. Different ratios of these compounds are found in different parts of a plant. For example, the green parts of a plant contain mostly alpha tocopherol and the seed germ and bran contain mostly tocotrienols. Along with other nutrients, tocopherols and tocotrienols are concentrated in thebran layers of the rye grain, and are only present at low levels in the flour endosperm. Tocopherols are also present in algae, mint teas, and other foods. According to a University of California study, alpha tocopherol (regular vitamin E) displaces critically important gamma tocopherol in the body. While alpha tocopherol inhibits free radical production, gammatocopherol is required to trap and neutralize existing free radicals. Prestigious scientific journals have highlighted gamma tocopherol as one of the most critically important forms of vitamin E for those seeking optimal health benefits. In fact, studies show the combination of alpha- and gamma-tocopherol supplementation appears to be superior to either supplementation alone on biomarkers of oxidative stress and on inflammatory factors. Most commercial vitamin E supplements contain little, if any, gamma tocopherol. They instead rely onalpha tocopherol as the primary ingredient. However, it is gamma tocopherol (not the alpha form) that quenches peroxynitrite, the free radical that plays a major role in the development of age-related decline. In a human study that combined gamma tocopherol with sesame lignans, gamma tocopherol/sesamewas 25% more effective than gamma tocopherol/tocotrienols in suppressing tissue measurements for free radical and inflammatory damage. Since tocotrienols are considered nature’s most potent antioxidants, the fact that low-cost gamma tocopherol with sesame is more effective is a remarkable finding. 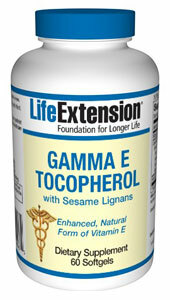 Life Extension has fortified the popular Gamma E Tocopherol supplement with standardized sesamelignans. Consumers obtain superior benefits at a much lower cost. This formula provides potent doses ofgamma tocopherol along with sesame lignan extract to augment the antioxidant effects of gammatocopherol.